The Prime Minister Narendra Modi’s trip to the US has been a stunning success from his point of view, but what has India got in the bargain? Modi is not India—at least, not yet. But Modi nonetheless confused his political interests with the country’s. The country feels cheated, as he brings back with him this appalling document called the ‘Joint Statement’ as the outcome of his five-day sojourn in the US. The picture that is bound to be silhouetted in memory for a long time will be that bewildered look on the face of Obama as he kept staring intensely at the face of Modi when the latter was reading out his media statement in Hindi language after their meeting. “Is this India’s new ruler?“, he seemed to be wondering—and with good reason, having known Manmohan Singh rather well. The Indian mediapersons have drawn comparison between Modi and Obama and scripted fairy tales. It’s all rubbish. Obama is everything that Modi is not—a highly educated, intelligent, cerebral intellectual on his own merit—and he’d never ever have helped himself to such a crude and vulgar spectacle as the one that Modi helped himself to in the Madison Square Garden. If Modi goes on this MSG track further, he runs the risk of becoming the joker in the G-20 and BRICS pack sooner than we think and that will do no good to India’s reputation. In fairness to the country he leads. Modi should have clinically segregated his own political agenda from India’s “enlightened national interests”. By all means he could have twinned his visit to the UN General Assembly, a veritable circus anyway, with a second one one at Madison Square Garden. But the India-US relationship, which has been in the doldrums, deserved a ’stand-alone’ visit with sufficient planning and preparation to back it. Another visit by Modi to Obama’s White House is improbable and an Obama visit to the Delhi darbar can be safely ruled out. Which means Modi lost a big opportunity to transform the relationship and make it contemporaneous with the post-2008 financial crisis in the world economy and to attune it to the imperatives of the development agenda on which he won a huge mandate in the elections in April-May. What actually has happened is that Modi may showcase in Ahmedabad that Obama greeted him saying ‘Khem Cho?’ But then, India has been left waiting in the ante-room in the White House. This is disgraceful and is contradictory to what Modi himself professed about foreign policy, namely, that the country’s interests come first. Let us examine the ‘Joint Statement’. If diplomacy is about ‘quid pro quo’, Obama taught Modi the first lesson—there is nothing like free lunch. Modi gave away nothing to the Barack Obama Administration, but he also got nothing in return. The Americans have not touched even with a barge pole Modi’s much-vaunted ‘Made in India global initiative’. They simply ignored it in the JS. If economic diplomacy is the driving force of Modi’s foreign policy, what has he got out of Obama? Peanuts. Some more ‘task forces’ or ‘working groups’ have been constituted at the bureaucratic level in the areas of investment, infrastructure, intellectual property, higher education, ‘climate resilience’, nuclear power projects, Energy Smart Cities Partnership, Clean Energy Finance Forum and, of course, in defence trade and technology. At the end of the day, Shinzo Abe promised $ 35 billion, Xi Jinping put down on the table $ 20 billion. How much money is Modi actually bringing back by way of Make-in-India US investment? Zilch. The only talk of money in the entire JS is that the US Exim-Bank will finance to the tune of $ 1 billion American renewable energy exports to the Indian market. Period. Quite obviously, America’s top priority lies in boosting its arms exports and the JS devoted a hefty portion as to how to go about it. The two sides reaffirmed their resolve to “build an enduring partnership in which both sides treat each other at the same level as their closest partners, including defence technology, transfers, trade, research, co-production, and co-development.” But, again, is there anything really, really new in all this? Equally, there is absolutely nothing new in the portions relating to regional issues except that Modi refused to join the US-led “coalition of the willing” against the Islamic State. It’s, no doubt, a sensible decision, because India has had nothing to do with the creation of the IS by the US and its allies, and has no reason to have IS blood on its hands. On the other hand, has a timeline been given for India’s admission to technology control regimes? No. Has the US shed its ambivalence and come out openly and strongly supporting India’s membership of the UN Security Council? No. True, the JS makes some cheeky remarks about Asia-Pacific (read China), but Beijing isn’t going to lose sleep over them. Much the same has been said before also, and so long as China continues to be the main driver of growth for the countries of the ASEAN region, nothing fundamentally changes in the power dynamic. The dogs bark, but the caravan moves on. It’s incredibly foolish on the part of India to pretend it has not noticed the 2008 financial crisis or that a profound shift in the locus of power ensued in regional and world politics. The JS envisages no special role for India in post-2014 Afghanistan. Nor does it commit the US to any meaningful collaboration with Delhi—lest it caused irritation to Islamabad, especially since the new Afghan President, Ashraf Ghani, is their consensus choice. Indeed, the one thing where we can draw particular satisfaction is that Modi didn’t get emotional, as his predecessor might well have, and refused to cave in on the “current impasse in the World Trade Organisation”. Bravo! In sum, if the month of September has been all about India’s big potentials as a “swing state”—swinging wildly between Tokyo, Beijing and Washington—what is the balance-sheet Modi can draw as he took off from Washington for Delhi? One, the US investment in India, which totalled $ 800 million last year, may not increase in a near future. The accent is on boosting arms exports. The Americans may pay lip-service to ‘Modinomics’—sanitation, smart city, Make in India, etc.—but remain wary and deeply skeptical. 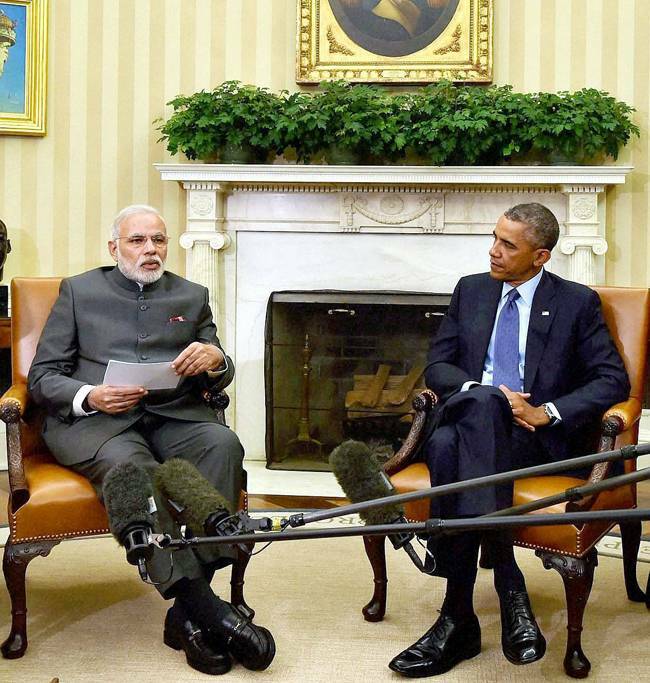 It showed on Obama’s face as he sat watching Modi read out his media statement. What does India do now? Swing back to Beijing? Clearly, the Modi Government lacks intellectual depth and it repeatedly showed up in India’s zigzagging diplomacy lately. Perhaps, Modi should stay put in India for the next several months and concentrate on the mountain-heap of problems at home. After all, the best way of attracting foreign investment will be by making India a credible destination.